Personalized 2x 3.5 custom business card magnets square corner – 20 mil is becoming a hotter mass gifting choice for advertisers who wish to reach out to more people in shorter time and at smaller budget. This magnetic business card will prominently show up from a cute refrigerator door at home or work cabinets from office. Businesses or entrepreneurs who are starting out new can always invest in a promotional 2x3.5 business card magnet and seek favorable responses from their targeted customers. 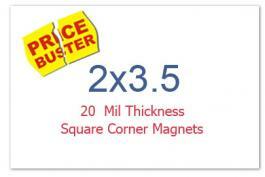 Advertisers can choose to improve the service life of a custom 2x3.5 business card magnet with their creative inputs.